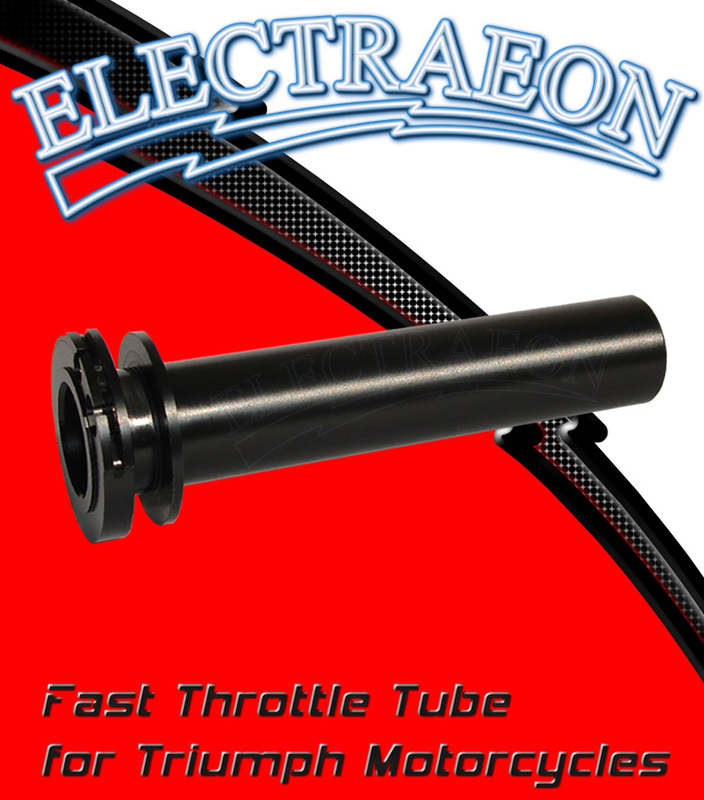 Electraeon Fast Throttle Tube for Triumph motorcycles. The Electraeon Fast Throttle Tube for Triumph motorcycles is a 1/4 turn style quick action racing throttle control that fully opens the throttle body butterflies with 70% rotation of the hand grip compared to stock. Reducing the amount of hand grip rotation improves ergonomics by allowing the rider to reach full open throttle with less wrist stress. The reduction of wrist to forearm angle at the handlebar also aids the rider in maintaining proper posture on the motorcycle improving control and drive off the apex when cornering. OEM throttle controls are different for each motorcycle manufacturer. What works on one brand will not work well on others and it is impossible for one design to work well on all brands. By designing this series of the Fast Throttle Tube specifically for Triumph motorcycles we have eliminated poor performance issues common to the one size fits all throttle controllers. The Electraeon Fast Throttle Tube is CNC machined from a solid piece of Delrin for high strength, light weight, and durability. The all Delrin construction provides friction free operation at all contact points resulting in a smooth feel and accurate throttle positioning. The one piece design eliminates the possibility of loose parts and is maintenance free. This version is available with geometry for use with non OEM style grips only. Installation will require a modification of the throttle cable ends on the throttle housing side and adjustment of the throttle cables at the throttle bodies. The modification is easy for those with skill using standard hand tools. For more information please see the installation instructions. Shipping in USA via USPS is $6. Shipping via USPS First Class to most other countries is $13.50USD.